The architecture of Ashford Castle dates from several eras. The oldest section is a 13th-century Norman castle that once belonged to the de Burgh family; in the 1500s it became an English fortress after Queen Elizabeth’s soldiers attacked. A French château (the original Ashford house) was added in the 18th century. But the major structure was built a little over 100 years ago. Its story began when Benjamin Guinness, head of the Dublin brewing company, came to County Mayo to pursue his archaeological interests. After falling in love with the beauty of the property and nearby Lough Corrib, he bought Ashford estate, the surrounding land, and other properties in this part of Ireland. His son, Sir Arthur Guinness, inherited 27,000 acres in County Mayo, and 33 islands in Lough Corrib. Choosing his father’s beloved property in Cong, Guinness worked with architect Joseph Fuller to build this enormous home incorporating both the castle and the château. Queen Victoria bestowed a peerage on Sir Arthur and his wife, who became Lord and Lady Ardilaun. After Lord Ardilaun’s death in 1915, Lady Ardilaun raised an obelisk on the grounds to his memory and lived in the castle until her death in 1939. The castle and contents were then sold at an auction that lasted two weeks. The government of Ireland bought the property and reforested 3500 acres. The next owner, Irish-American industrialist John Mulcahy, renovated and enlarged the castle as a hotel. Over the years the castle has hosted such luminaries as King Edward VII, for whom a special billiard room was built. Oscar Wilde was a frequent guest, and President Ronald Reagan stayed here in 1984. Ashford has always been one of my favorite castle hotels and I didn’t hesitate to recommend it for a top pick on Uber Guides “Top Ten Castle Hotels of Europe,” shown on the Discovery Travel Channel. From the moment you cross the drawbridge and portcullised passageway under a turreted tower, you’re transported into an extraordinary experience. 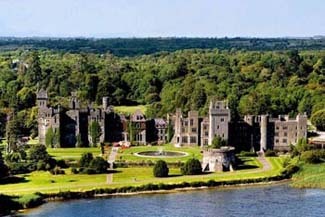 Cong is about 50 km (30 miles) north of Galway between Lough Mask and Lough Corrib. Ashford proves that a castle can rank among the finest luxury hotels in the world. Its imposing exterior, elegant interior, and lovely grounds combine to create a memorable and pleasurable vacation experience. When the weather outside is stormy, there’s not a cozier place to be than in one of Ashford’s public rooms amongst the fireplaces, rich wood-coffered ceilings, Waterford chandeliers, enormous Chippendale mirrors, period furniture, and fine art objects. The elegant and comfortable deluxe guest rooms boast fireplaces and carved antique furniture. Standard rooms are a little smaller. High windows and Georgian antiques grace the impressive suites, located in the old section of the castle. Many have claw-foot tubs. For a pre-dinner drink, try the formal Prince of Wales Cocktail Bar, built in the late 1800s in honor of a visit by the Prince of Wales—the future King George V of England, or a relaxed and fun option is the Dungeon Bar, complete with evening entertainment. The George V dining room (jacket and tie required) offers elegant dining, while the intimate Connaught Room (open May-September) presents a tasting menu based on fresh local produce, with wine pairings. You can walk along extensive paths or stroll the lovely grounds (scenes from The Quiet Man, with John Wayne and Maureen O’Hara, were filmed here. Lough Corrib is famous for its trout and salmon fishing.